MAKE POSTERS and lots of them. Keep it simple: “LOST DOG or CAT!” should be at the top in large, easy to read, (even from a moving vehicle) bold letters. Then include a brief description or breed type: “Beige, wire-haired terrier ” or “Striped grey and black short-haired cat “. Don’t assume that people will know your particular pure breed, so always include a description. Include the animal’s name. Include your telephone number in large numbers at the bottom of the poster. Make dozens of index cards with the same information as above, and go to every home, in every direction from the site of where your pet disappeared, and give a card, or stick a card under doors or on windshields. 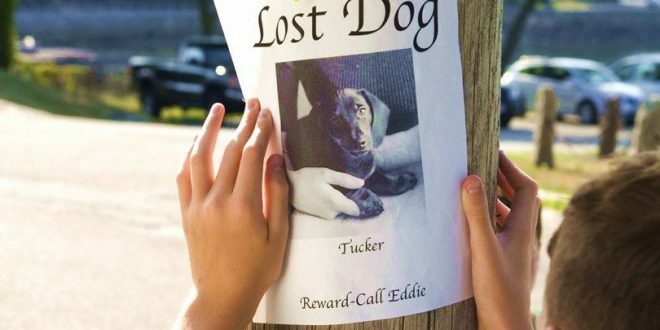 Stop and speak with neighbors and with every person you encounter –the more people know about your lost pet, the more likely the one person who spots him will call you. Your pet may be frightened, ask people to please check their barns and sheds, especially at night. Cats especially hide underneath porches or under backyard sheds. Get out and call for your pet by name. Enlist family and friends to canvas the neighborhood, in all directions, on the roads and as the crow flies. Don’t try to predict where your pet could or wouldn’t have gone –YOU NEVER KNOW. The best time to find your pet is at night, and at dawn. Cats are nocturnal and often return to the house and find it dark and locked up. Keep porch light on and door open and sit and watch the door in case the animal returns. CATS: Place their dirty litterbox outside on porch or leave garage door open several inches and put smelly wet food and water in bowls. Place bedding or blankets that have their smell on it outside on porch or inside garage. Take items of clothing with your smell on it and put it with other items. Drop off posters at all rescues and animal shelters. Don’t rely on their information, go through and look at all dogs and cats, DAILY.